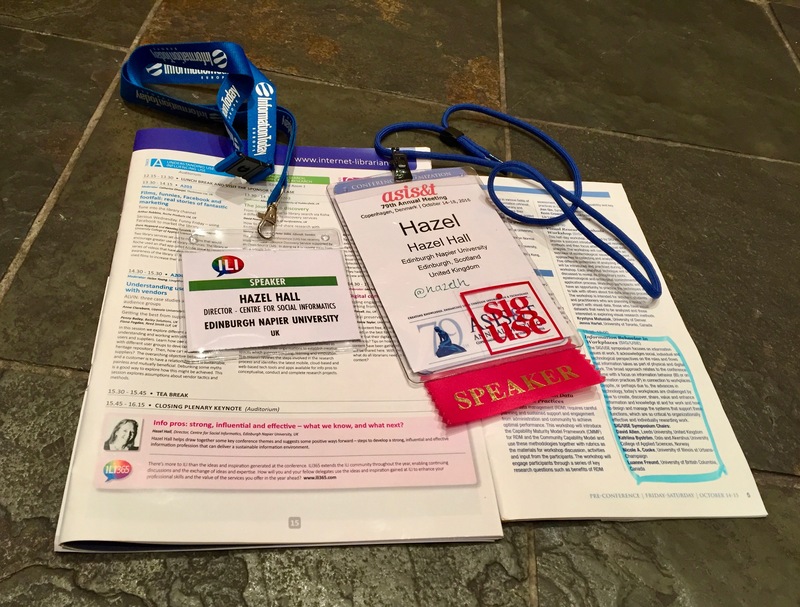 Last month I participated at two conferences back-to-back: the 79th Annual Meeting of the Association for Information Science and Technology (ASIST2016) in Copenhagen from Friday 15th to Tuesday 18th October, and then the second day of Internet Librarian International (ILI2016) in London on Wednesday 19th October. Travelling between Copenhagen and London, and then returning home to Edinburgh on the same day, was quite a feat of logistics which involved many modes of transport (taxi, plane, train, tube and car), and 12,673 steps, as well as great relief when I reached my final destination in Scotland 19 hours after leaving my hotel in Denmark. Of course I didn’t sleep terribly well (in fact very little at all) the night of 18th October. This was partly because I was afraid of missing my 05:00am alarm, but also because I was buzzing from the last day of ASIST2016. This included: the awards luncheon at which the ASIST European Chapter did particularly well (bravo Isabella Peters! 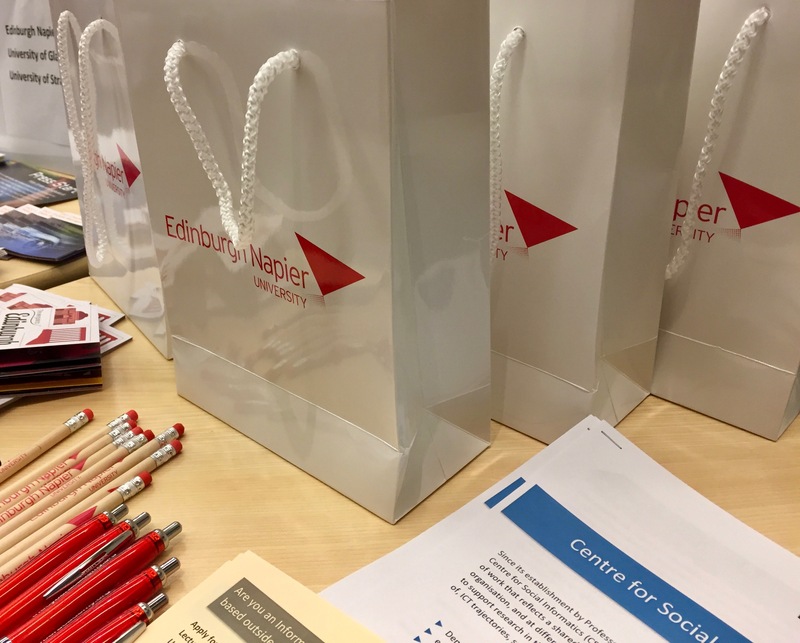 ); a session on accreditation, which I tweeted on behalf of colleagues in the UK who could not be there; and the University Reception in the evening, at which Edinburgh Napier University shared a stand with Glasgow and Strathcylde universities. Just a few hours later I was on my way to England. My participation at ILI2016 was not part of my original plans for October 2016. In fact I had to engage in some complicated travel itinerary jiggery-pokery to change a schedule from one that would have taken me straight back from Denmark to Scotland on 19th October to another that incorporated a stop in London. The reason for the change was the UK Electronic Information Group’s announcement on 28th September that I was the 2016 winner of the Jason Farradane Award. By tradition the ceremony for this award falls on the last day of Internet Librarian International. As soon as I confirmed that I could make it to ILI2016, the organisers asked if I would be willing to close the conference with a plenary keynote in which I would draw together some of the key conference themes and suggest steps for the development of a strong, influential and effective information profession. I happily agreed to do so. In the event my ILI2016 presentation comprised two parts. In the first I discussed some of the headline findings of the Workforce Mapping Project and its impact to date. I did so by extending the detail of the summary of the project as presented at my ASIST poster. Then I spoke of my experience of participating at ILI2016 remotely through Twitter up until the afternoon of 19th October. My main message, however, centred on the value of engaging in events such as ILI2016 for three types of development (1) of our own professional expertise, (2) to enhance services delivery, (3) to develop others. This is achieved through learning, acting on that learning, and the influence and impact of this learning on end users. I related these ideas back to the content of ILI2016 – both experienced in person on 19th October, and mediated through Twitter. The slides from my presentation are available on SlideShare and below. The highlight of my day on 19th October, however, was the awards ceremony. The Jason Farradane Award was presented to me by Nicky Whitsted, Chair of the UK Electronic Information Group (UKeIG), and formerly Director of Library Services at the Open University. The award itself comprises a framed certificate and a glass trophy. These will be proudly displayed in the trophy cabinet in the School of Computing at Edinburgh Napier University. (The University has already publicised the award on its news pages.) 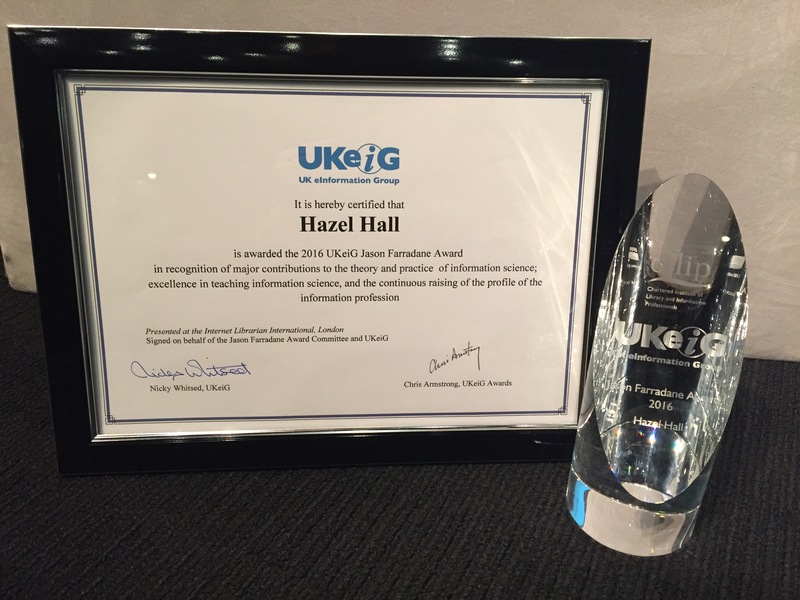 Special thanks are due to all who made this such a memorable day – especially Val Skelton and her colleagues at UKeIG and Information Today Europe. This entry was posted in Awards, Events, PhDs, Projects and tagged #ASIST2016, #ili2016, ASIST, Association for Information Science and Technology, Bright Club, Frances Ryan, Information Today Europe, Internet Librarian International, Isabella Peters, Nicky Whitsted, OCLC, UK Electronic Information Group, UKeIG, Val Skelton by Hazel Hall. Bookmark the permalink.